Hot on the heels of Marvel revealing the new female Thor, and Sam Wilson as the new Captain America; Entertainment Weekly has a group-shot that purports to reveal the newest team of Avengers. 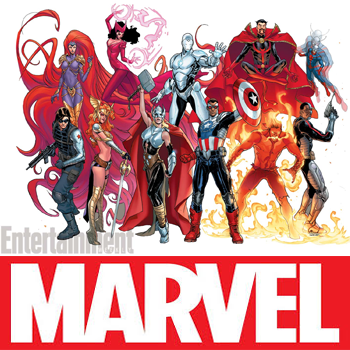 The lineup appears to include (clockwise from top-left) Medusa, Scarlet Witch, Superior Iron Man (identity unknown), Doctor Strange, Ant-Man, Deathlok, Inferno, the new Captain America, new Thor, former Spawn frienemy Angela and Bucky Barnes ("The Winter Soldier"). While the reasons behind the changes to Captain America and Thor have already been revealed, much about the revamped Iron Man is still unknown. Stark's new handle being "Superior Iron Man" is an obvious reference to Superior Spider-Man, a controversial recent storyline where Spider-Man was replaced by the villain Doctor Octopus, and Marvel EIC Alex Alonso describes the new Stark as "hard to root for." The character's new Apple-esque armor appears to be a deliberate reference, as Stark's new status-quo will see him moving shop to San Fransisco with a "vision" for the city that rankles some of the locals - possibly setting up an allegory for the political and class-conflicts that have sprung up between SF-based tech companies like Google and some residents. Notably, Strange and Ant-Man are characters expected to see their profiles expand because of their upcoming presence in the Marvel Studios movies. Medusa and Inferno, meanwhile, are members of The Inhumans; a race of superhuman creatures some have speculated could be used to the fill the space of Mutants in the Marvel Cinematic Universe. Also raising an eyebrow is the presence of Angela. Originally a Neil Gaiman-created supporting character from Todd MacFarlane's Spawn-mythos for Image Comics; she was more-or-less "gifted" to as part of an incredibly complicated series of legal maneuvers intended to secure control of the rights to MarvelMan and (widely-presumed) as a thumb in the eye to MacFarlane from Gaiman. Avengers NOW and other new titles are expected to debut in November.